Visa-exempt foreign nationals : All European Union citizens, Algeria, Andorra, Argentina, Australia, Bahamas, Bahrain, Barbados, Benin, Botswana, Brazil, Brunei, Burkina Faso, Burundi, Cameroon, Canada, Cape Verde, Central African Republic, Chad, Comoros, Congo, Democratic Republic of the Congo, Costa Rica, Côte d'Ivoire, Egypt, El Salvador, Ethiopia, Fiji, Gabon, Gambia, Ghana, Grenada, Guatemala, Guinea, Guinea-Bissau, Haiti, Honduras, Iceland, India, Israel, Jamaica, Japan, Kenya, Kiribati, Kosovo, Kuwait, Lesotho, Liberia, Liechtenstein, Madagascar, Malawi, Malaysia, Mali, Marshall Islands, Mauritania, Mauritius, Micronesia, Monaco, Morocco, Namibia, Nepal, New Zealand, Niger, Nigeria, Norway, Oman, Russia, Rwanda, Saint Kitts and Nevis, Saint Lucia, Saint Vincent and the Grenadines, Samoa, San Marino, Seychelles, Sierra Leone, Singapore, Solomon Islands, South Africa, South Korea, Sri Lanka, Suriname, Swaziland, Switzerland, Thailand, Timor Leste, Togo, Tunisia, Turkey, Tuvalu, Uganda, Ukraine, United Arab Emirates, United States, Vanuatu, Vatican City, Zambia, Zimbabwe. Nationalities subject to visa and eligible for e-Visa online: citizens of all other nationalities can obtain their visa online (e-Visa) or in embassies. 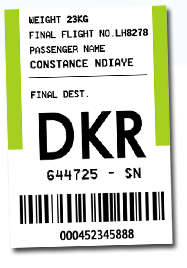 Note: a passenger who does not have Senegalese identity papers (passport or identity card) is considered as a foreign passenger even if he / she has a multi-citizenship and must therefore be in possession of a visa . E-Visa online procedure : Senegal has established since 2013 the obligation to obtain a biometric visa for travelers of nationalities who were hitherto exempted. The visa procedure is quite complicated and happens in two stages. At first, the payment of the visa (50€) and of the cost of delivery shall be made on the dedicated website (www.visasenegal.sn). A number of information must be provided at this time online. Once this step is complete, a visit to a diplomatic representation equipped to issue biometric visas is required. You will undergo a strict control of all documents, as well as a taking of a digital photo and a fingerprinting of all fingers. A special procedure for taking fingerprints of 10 toes is provided for disabled passengers no longer having fingers in particular for our bi-national leper compatriots residing abroad but having no more Senegalese documents. Depending on consulates and peak periods, formalities can be long. So you will need a full day to get your visa. Accordingly, it is recommended that travelers look in detail what papers and documents are required for the visa, especially if you live hundreds miles far from a Senegalese diplomatic representation. As an exception, any passenger subject to the visa in Senegal, who for various reasons is not able to pre-enroll or to join an embassy or consulate or to access the visa website (www. visasenegal.sn) can board with the pre-visa and be granted a BIOMETRIC VISA at our international airports (Dakar Leopold Sedar Senghor, Cap Skirring) where they will undergo the procedure (fingerprinting of 10 fingers or toes, document checking, digital photos, etc.). Standard procedure in embassies: if you are not eligible for the e-Visa or if the type of visa you wish can not be obtained through the e-Visa procedure, you can go to the nearest Senegalese embassy with the required documents they asked you to bring.